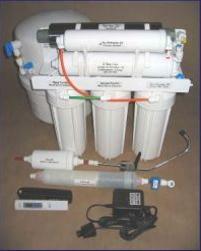 The AquaMagna Magnetic Descaler is an easy-to-install, non-chemical method of hard water treatment. 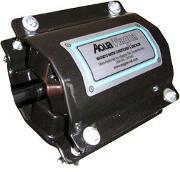 Is the AquaMagna Magnetic Descaler the answer to your Hard Water Conditioning problems? The cost … is just a fraction of the cost of a traditional water softener. Suffering from Hard Water? An AquaMagna Magnetic Descaler Water Softener is the Answer! Our no-salt water softener and descaler is a salt and chemical free water softening method. Not only is our system easy to install, it works to protect your hot water tank in the long-term. Installs in seconds. No plumbing. No tools. Simply clamps on water pipes and silently goes to work when the water flows. Has no moving parts to wear out. It lasts forever! Water feels softer. Soap works better. Clothes become cleaner. Hair is softer and silkier. Unsightly lime scale and stains are reduced and easily wipe away. Water tastes and smells better (foul sulfur and chlorine odours are greatly reduced). Kitchens and bathrooms will look new again. 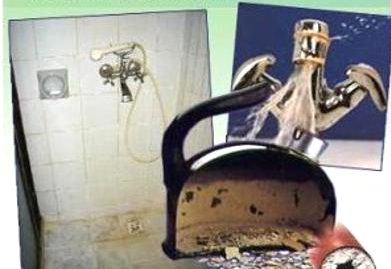 Ugly stains on sinks, tubs and toilets begin to soften and clean up. Laundry becomes easier. Use less detergents and softeners while getting whiter, brighter and softer laundry without soap residue. Delicate fabrics will last longer. Increased water pressure will result as scale build up in pipes is reduced. Saves money year after year! Saves up to 30% of your hot water heating costs. Water heaters will no longer be coated with that hard water scale that “robs you” on your hot water heating bills. Designed with high-strength barium ceramic magnets, our maintenance-free system is inexpensive, when compared to traditional water softeners, uses absolutely no energy, salt or chemicals and is scientifically proven to inhibit calcium and lime scale from forming. 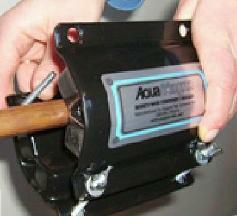 The AquaMagna Magnetic Descaler also removes existing scale from your pipes and hot water tank over the long-term. Frustrated by reduced water pressure? Tired of calcium deposits clogging your faucets and shower heads? What about that hard to remove lime scale build-up on shower doors and tiles? With a magnetic water softener you don’t have to suffer from the side effects of hard water any longer. A magnetic water softener works to remove scale build-up from your pipes and other problem areas in your home. Rather than using salt or harmful chemicals, a properly-designed water magnet works naturally on a molecular level to stop the build-up of scale and grime on your pipes and faucet from happening in the first place. How Does a Magnetic Water Conditioner Work? Magnetic water softeners soften and condition your water, allowing you to enjoy the benefits of soft water without the harmful side effects of chemicals and salt that you would experience from traditional water softening systems. Removing existing build-up from your pipes and preventing future build-up of scale and grime in your home is basically how a magnetic water conditioner works. Water magnets work on a molecular level to stop the build-up of scale on your faucet and pipes from happening in the first place. Water magnets ensure that minerals in your water which may cause the build-up of scale with other water systems never have the opportunity to form. Why Choose a Saltless Water Softener? A salt water softener can add sodium to your water. No one wants to increase the sodium in the water you use, especially if you drink that water on a daily basis. If you don’t want to purchase and move heavy bags of salt then you should consider purchasing a magnetic water softener. Contact us today to learn more about the benefits of using a magnetic water softener. You should choose a saltless water conditioner like a magnetic water softener to condition and soften your water because it is a green, environmentally friendly choice. Water magnets are a more environmentally friendly and economical option than chemical water softeners which can be harmful to the environment. With chemical water softeners you are introducing and releasing chemicals into the environment unnecessarily. In addition, why would you want to add chemicals to your water when you have a chemical-free option such as a magnetic water softener. A lot of people prefer to use a magnetic water softener to condition and soften their water because it is so affordable. With a system like a magnetic water softener your costs are all upfront, you will not be spending money or effort on maintenance of your system down the road as you do with a chemical or salt water softener. For some people such as the elderly, the maintenance required for chemical and salt water softeners is too much to handle. The heavy bags of salt and the awkward chemicals can pose a hazard for some people who may have difficulty filling their water tanks. In addition to saving money on system maintenance, with a magnetic water softener you will save money on home maintenance. By preventing corrosion of pipes you can save a lot of money on potential plumbing issues in the future. Having drains that don’t clog will also save you time, money and headache down the road. There are many different benefits to using a magnetic water softener. Not only will you be able to improve the feel, taste and smell of your water you can also improve your own health and ensure your home’s pipes, faucets and drains work well. Magnetic water softeners will help prevent grime and scale from forming in your home, which will make cleaning and maintaining your sinks, showers, toilets and bathtubs much easier. Why spend time scrubbing away lime scale when you could enjoy the benefits of a cleaner home with a magnetic water softener. As an all-natural, environmentally friendly water softening option there are many benefits to installing AquaMagna Magnetic Descaler softener system in your home. You can eliminate the harmful side effects of hard water without adding salt or harmful chemicals to your water. Not only will you enjoy the maintenance-free aspect of our system, you will also save money in the future with lower maintenance costs. Take action now! Contact us today to learn more about the benefits and more details of our magnetic water softener system. The complete No Salt AquaMagna Magnetic Descaler system includes two sets of magnets: one for the hot water line and one for the cold. Easy-to-follow instructions show you exactly where to place them on your water pipes. AquaMagna Magnetic Descaler water magnets are sized to fit on water pipes from ½” to 1 ½” in diameter.